James A. DeLeo was educated in the Chicago public schools and attended Chicago Loop Junior College and DePaul University, where he majored in political science. While at DePaul, he worked for the Chicago Police Department and was later employed by the Cook County Sheriff’s Department. 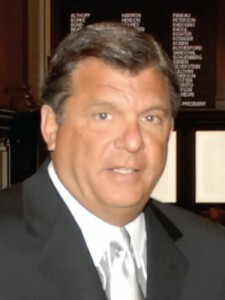 James A. DeLeo was first elected to the Illinois House of Representatives in 1984 when he ran for State Representative of the 16th District. He served four terms in the Illinois House of Representatives from 1985-1993, during the 84th, 85th, 86th, and 87th General Assemblies. He was Chairman of the House Committee on Consumer Protection and Vice-Chairman of the House Committee on Registration and Regulation, while serving as a member of numerous other committees. In 1992, James DeLeo was elected to the Illinois State Senate representing the 10th Legislative District. The 88th General Assembly committee assignments included Minority Spokesman for the Commerce and Industry Committee and as a member of the State Government Operations and Executive Appointments Committee and the Insurance, Pensions and Licensed Activities Committee. During the 89th General Assembly Senator DeLeo served as Minority Spokesman for the Senate Committee on Executive Appointments and as a member of the Senate Committee on State Government Operations. Senator DeLeo held the Democratic leadership post of Assistant Minority Leader and Democratic Caucus Chairman throughout the 90th and 91st General Assembly and as a member of the Senate Committee on Executive Appointments and Licensed Activities. He served as Co-Chairman of the Senate Committee on Executive Appointments and member of the Licensed Activities Committee throughout the 92nd General Assembly. For the 93rd General Assembly, Senator DeLeo was appointed to the Democratic Leadership Post of Assistant Majority Leader. He served as Vice Chairman of the Senate Committee on Executive Appointments and as a member of the Executive Committee and also the Licensed Activities Committee. Senator DeLeo retired from his Senate seat in July of 2010 after serving the people of Illinois for 26 years. He still holds the position of State Central Committeeman of the 5th Congressional District of Illinois. He also serves on the Board of Directors at Belmont Bank & Trust. In August of 2010 he opened James A. DeLeo & Associates, a consulting firm located in Chicago. Senator DeLeo resides in Chicago with his wife, Ann Filishio-DeLeo, and their two children. Senator DeLeo has been recognized as “Man of the Year” and “Legislator of the Year” by numerous organizations and associations during his legislative career. He also received the “Statesman of the Year” award from the International Union of Operating Engineers. In 1997 he was honored with the “Victoria Denise Deron Award” by the Special Children’s Charities/Special Olympics. The Chicago West Suburban Chapter of UNICO National named Sen. DeLeo “Humanitarian of the Year” in April 2000. The Sons of Italy in America Law Enforcement Lodge No. 1 honored Sen. DeLeo as the Year 2000 “Man of the Year” in November. The Flowers of Italy Club named Sen. DeLeo “Man of the Year 2001” on March 17, 2001 and on September 26, 2001 he received the prestigious Justinian Society of Lawyers “Award of Excellence.” In 2003, Jim was awarded The Leonardo da Vinci award for Outstanding Achievement in Government In 2003 and also was named Advocate of the Year by the New Horizon Center for the Developmentally Disabled. James was a lead sponsor of legislation which created “The Autism Project”, a service which provides assistance to children and families related to autism spectrum disorders.